Aichmophobia, pronounced (āk-mə-ˈfō-bē-ə), is the fear of sharp objects. This phobia of sharp things encompasses a wide range of specific fears. Some people are afraid of cutting or stabbing themselves and others of injuring someone else. Trypanophobia, or the fear of medical needles, is sometimes classified as a form of aichmophobia. Belonephobia is the fear of all needles and may refuse all injections or tests that involve the use of needles. Like all phobias, aichmophobia has different triggers in different people. Some people are afraid only of particularly sharp knives, such as chef knives or hunting knives. Some fear all knives. Others are afraid of pins and needles. For example, one woman says her sewing triggered a fear of needles for days afterward with her visualizing needles piercing her skin. Some people fear all objects that they perceive as sharp, including umbrella points, paper clips and clothes hangers. In general, the worse the phobia is the more items that are perceived as triggers. Mageirocophobia, or the fear of cooking, is sometimes related to aichmophobia. It is difficult or impossible to prepare meals from scratch without using sharp knives. Ironically, this fear actually makes it more likely that you will cut yourself during the cooking process. 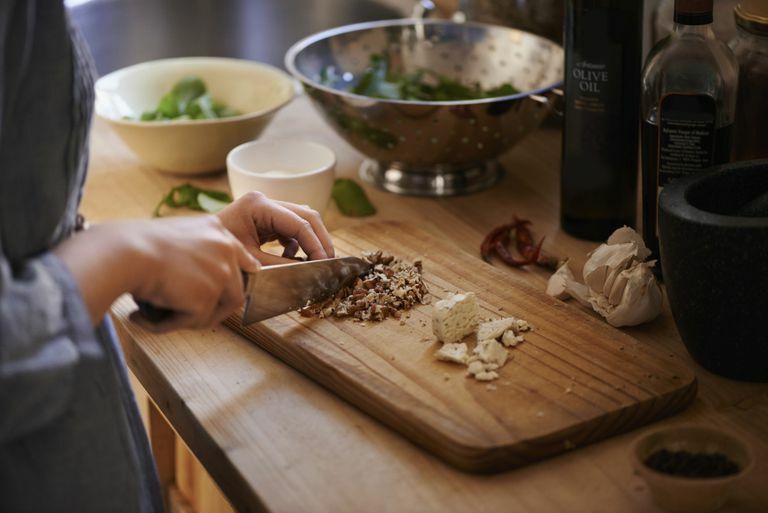 Many people with a fear of sharp knives attempt to chop vegetables or de-bone meat with a dull knife, vastly increasing the chances that the knife will catch or jump. People with this fear might also use knives incorrectly, believing that it is safer to hold the knife further back on its handle. This provides less control over the knife, again increasing the risk of injury. The fear of sharp objects may drastically limit your ability to perform common tasks of daily living. Opening packages, making minor household repairs, sewing and many craft projects often require the use of knives, scissors or other sharp objects. Like cooking, aichmophobia can actually make these tasks more dangerous, since people who are afraid of tools tend to wield them improperly. Although the fear of medical needles is sometimes considered a subset of aichmophobia, the two phobias are actually quite different. While those with aichmophobia are afraid of working with sharp tools, trypanophobia is specific to medical procedures. In general, those with trypanophobia are unafraid of other sharp objects. In many cases, it is the medical procedure itself rather than the needle that triggers the phobic reaction. Like all phobias, untreated aichmophobia tends to worsen over time. For example, a mild fear of very sharp knives might gradually grow to include knitting needles, then straight pins, and eventually scissors. With treatment, however, aichmophobia is generally easy to overcome. Many people find that they can beat a mild fear through education and exposure. Learning proper knife skills, studying expert seamstress videos and working alongside a competent handyman can provide confidence. If your fear is more severe, however, professional assistance may be required. In most cases, aichmophobia responds well to a variety of brief therapy options.